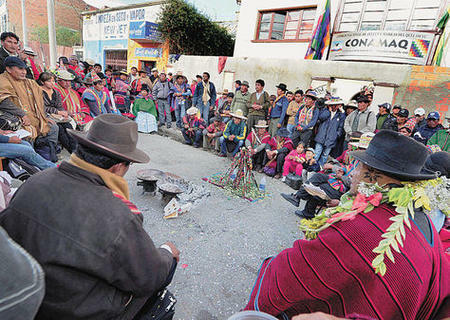 Over the past several months, Bolivians have witnessed the crisis of CONAMAQ, a confederation of Aymará and Quechua communities in the Bolivian highlands. Since 1997, CONAMAQ has championed the rights of highland indigenous peoples to direct representation, self-determination, and collective control of land and resources. Today, it has fractured into warring parallel organizations, one supporting the Movement Towards Socialism (MAS) government of Evo Morales, and the other—the original “organic” CONAMAQ—increasingly turning against it. In early December, a disputed election between the rival factions led to a police siege of CONAMAQ’s La Paz headquarters and a series of violent confrontations, followed by hunger strikes, vigils, and road blockades by the “organic” faction (which led the organization until December). “Organic” CONAMAQ then threatened to blockade the Dakar Rally, a mega-sports and tourist spectacle featuring a cross-continental auto and motorcycle race that passed, for the first time this year, through the Bolivian highlands. The blockade was cancelled due to threats of a heavy military presence and a counter-blockade by pro-government social organizations (or, from the perspective of the pro-government faction, a lack of popular support). On January 15, the pro-MAS group violently seized control of CONAMAQ’s headquarters as police looked the other way. The action was denounced by Bolivia’s human rights Ombudsman and by UN officials in Bolivia. As to the causes of the rupture, there are conflicting perspectives. According to Vice Minister Alfredo Rada—one of several prominent members of the Morales government who cut his political teeth working with NGOs in support of indigenous organizations—CONAMAQ “self-destructed” when its bases lost confidence in their leadership. CONAMAQ’s alliance with the lowlands indigenous federation CIDOB in opposition to the TIPNIS highway, Rada argues, precipitated a growing organizational break with Morales that was not supported by its constituency. The final straw, says Rada, was CONAMAQ’s recent pact with the Green Party, a small pro-ecology bloc that will oppose Morales in the upcoming (2014) presidential election. Their candidate, Jorge “Tuto” Quiroga, was a former leader of the conservative political opposition, defeated by Morales in 2005. Critics say that CONAMAQ’s troubles are not a product of internal strife, but reflect a deliberate strategy by the Morales government to intervene and undermine the organization’s organic leadership. CONAMAQ, they argue, is only the most recent in a series of independent indigenous and social organizations that have been torn apart by rival factions which the government has encouraged and financed. Whether the new parallel groups have been created, abetted, or merely opportunistically exploited by the Morales government, the relationship appears to be mutually beneficial. Pro-government CIDOB now receives significant funding for development projects and services, while the original faction is considerably debilitated. While the new CIDOB has already had some differences with Morales—for example, over its recent unsuccessful bid to permit the election of indigenous deputies through their traditional organizations, rather than through the political parties—it has provided him with unequivocal political support. Pro-MAS CIDOB and CONAMAQ have joined with the three major national peasant organizations to resurrect the Unity Pact, the coalition of social movements that brought Morales to power in 2005. This is a critical step in the run-up to the 2014 election, where Morales is seeking a broad (70%) mandate for his third presidential term. For MAS dissidents like former Cochabamba governor Rafael Puente, the CONAMAQ episode reflects an increasingly disturbing trend towards MAS government intervention in civil society affairs. Even human rights organizations appear to be falling victim to the growing official preoccupation with controlling dissent. 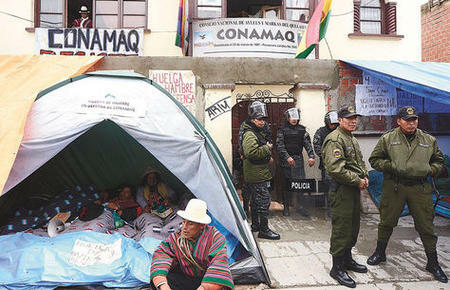 Just two days after the final ouster of “organic” CONAMAQ, police occupied the offices of the 38-year-old Permanent Human Rights Assembly of Bolivia (APDHB), along with a dissident pro-MAS faction critical of the organization’s loan of office space to the displaced indigenous group. According to APDHB president Yolanda Herrera, it was the first police intervention of a human rights organization since Bolivia’s return to democracy in 1982. For anthropologist Xavier Albó, the splits in both CONAMAQ and CIDOB illustrate how relations between the MAS government and indigenous-identified groups have deteriorated since the TIPNIS controversy. For Albó, Morales’s continuing “doublespeak” on environmental issues is especially problematic. As a recent pertinent example, he cites Morales’s nationalistic promotion of the Dakar Rally, which indigenous and environmental groups (in Chile as well as Bolivia) have protested as a threat to fragile ecosystems, wildlife habitats, and archaeological sites. Even worse, to compensate for potential environmental degradation, the Dakar sponsors have committed $500,000 to conserve a forest in the Peruvian Amazon—exactly the type of carbon credit scheme that Morales has denounced at home and abroad. For Puente, the post-TIPNIS revival of mutual distrust has also been marked by the reemergence of a “colonialist mentality” among some campesino and official sectors, which degrades indigenous-identified peoples. For indigenous groups, Puente argues, this also takes the form of pacting with conservative oppressors as a means of retribution against their own unresponsive leaders, repeating a historical pattern that dates back to the Incas and the Conquistadors—with disastrous results. From a political perspective, as former MAS Vice-Minister of Lands Alejandro Almaraz has noted, CONAMAQ’s and CIDOB’s traditionalist worldviews have long run counter to the grain. Their promotion of ancestral, communitarian forms of social organization, land ownership, and control of resources challenges the logic of syndicalist peasant capitalism that has been the dominant ideology in Bolivia since the nationalist 1952 Revolution. Today, the principles espoused by CONAMAQ and CIDOB appear to be increasingly in conflict with the Morales government’s developmentalist agenda, which includes expansion of the agricultural frontier, remercantilization of land, and resource extraction in indigenous territories. Still, these policies have significant popular support. Whether due to internal division or external design, the weakening of independent organizations like CONAMAQ and CIDOB will certainly help to diminish any remaining political obstacles to advancing this program.